The controversy over whether President Trump is using his Secret Service-issued smartphone, or if he still prefers his old, unsecured Android handset, is showing no signs of abating. Two senators have written a formal letter asking just what the situation is, and if security protocols are being followed. Senators Claire McCaskill (D-MO) and Tom Carper (D-DE) wrote the letter to the government’s Defense Information Systems Agency, headed by current Secretary of Defense General James Mattis. They ask if the president has been issued with a secure phone, if he's using it, and whether the device is properly preserving his numerous tweets. "While it is important for the President to have the ability to communicate electronically, it is equally important that he does so in a manner that is secure and that ensures the preservation of presidential records," the senators wrote. Trump has deleted some of his Tweets in the past, usually for spelling mistakes, but the corrected version is usually reposted. The senators want to make sure nothing is permanently erased. "The National Archives and Records Administration (NARA) considers President Trump's tweets to be records that must be adequately documented, preserved, and maintained for historic purposes, as required by the Presidential Records Act." The letter, dated February 9, was released just hours after the president and Japanese prime minister Shinzo Abe received news of North Korea’s latest missile test as they ate dinner at the crowded Mar-a-Lago club. Some of his staff members used the flashlights on their phones to illuminate the papers, and reports say Trump took calls on his vulnerable Android device. The letter states that the "security risks associated with the use of an unsecured phone include hackers' ability to access the device to turn on audio recording and camera features, as well as engaging surveillance tools that allow location and other information tracking features." 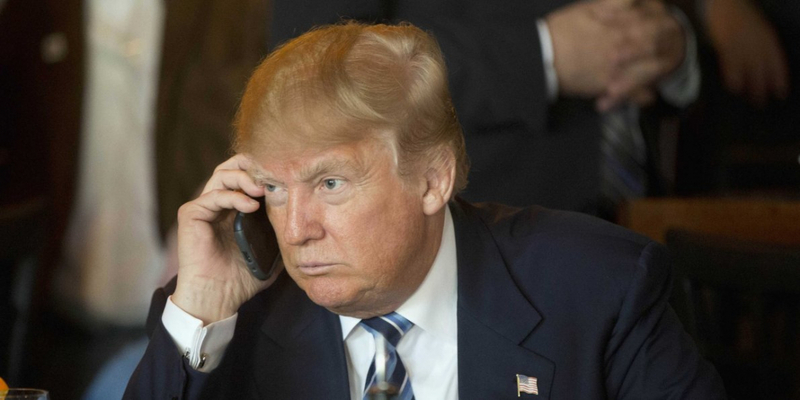 The New York Times reported that Trump had handed in his old Android handset, believed to be a Samsung Galaxy S3 from 2012, for a government-issued secure one when he took office last month. But the same publication later claimed he was still using the old, Android device. The senators have asked for a response to their questions by March 9.